Ever since Tecno Mobile was born in 2006, the company has continued to churn series after series into the phone market. Some of the phones in these series are Tecno Phantom and Tecno Camon, both of which I’ve had the pleasure of interacting with as they grew and grew in features and developments. The latest phone to hit to market is the Tecno Spark, which hit the Kenyan shops yesterday. Being an entry level phone, the Tecno SPARK is one of the best selling in the country, with the SPARK 3 coming in at a price tag of 12,499/-. The phones can easily be ordered online on Jumia as well as other Tecno branded shops in the country, and they’re coming with a limited edition gift hamper to boot. This third variation of the SPARK brings a user experience of the latest Android Pie System. 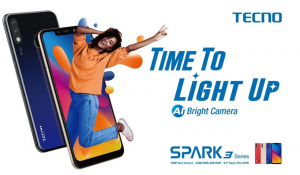 It will come in different attractive colours depending on whether you pick the Tecno SPARK Pro, or the Tecno Spark which will start selling next month (April) from 25th. The Pro is in Bordeaux red, midnight black, champagne gold and Nebula blue, and the SPARK 3 will come in aqua blue. The SPARK 3 comes in TWO variants, SPARK 3 PRO and SPARK 3 with a difference in storage, with SPARK 3 PRO packed with 32GB+2GB while SPARK 3 packs 16GB+2GB. I won’t say too much before I use the phone and do a comprehensive review, but let me say that if you’re looking for a smart phone on a budget, this might be it. With a 13+2 dual AI Camera, 6.2″ HD plus notch, and other features like face and fingerprint unlock, the gadget is not shabby at all. Quite a win to smartphone penetration in the Kenyan market.